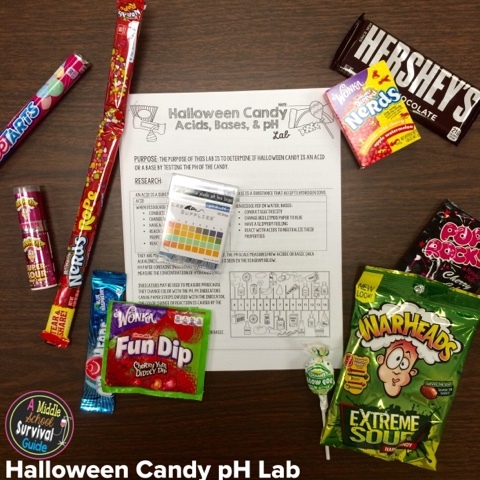 The purpose of this lab is to determine if popular Halloween candies are acidic or basic (alkaline). 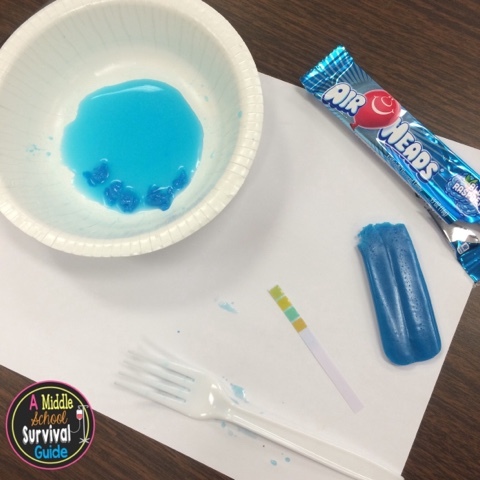 The students will follow the scientific method to test using pH paper and baking soda as indicators. This lab is intended to be used to determine whether Halloween candy are acids or bases and to identify them on the pH scale. 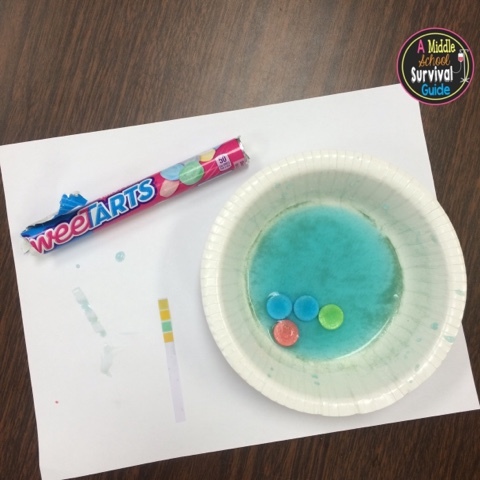 After reading the purpose and research for the lab, the students will create a hypothesis for each substance that will be tested. 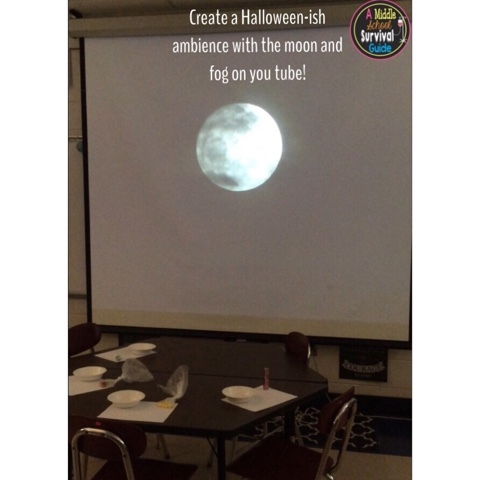 They will record their observations, complete analysis questions, and write a conclusion. The first step is to gather materials. I considered having students bring in few pieces of Halloween candy, but in this case, I went out and purchased the candy from my local candy store. $20 later, I recommend buying less candy (you don't need much to get the results) or having students bring in candy. In the picture below, you can see the variety of candies I purchased. It is best to have a mixture of sour, sweet, and chocolate candies. 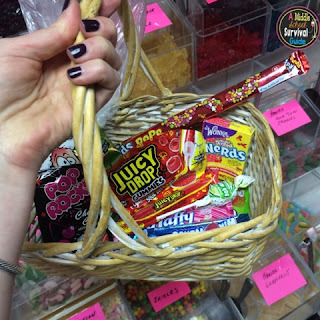 It is also best to consider that highly dyed candies (i.e. the red fun dip and red nerds) may alter the results if they are too red. This was the only candy we had difficulty reading the results of. 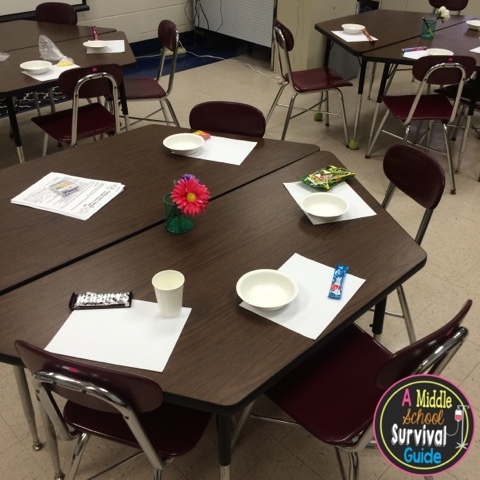 I set up my room for the lab groups to test four candies each. 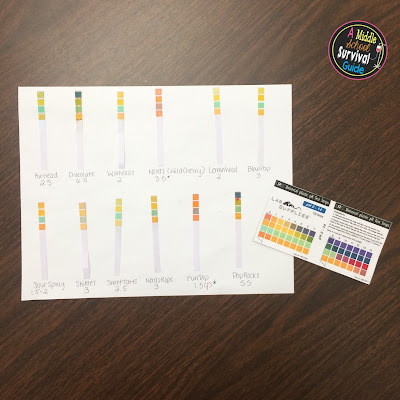 While I have had students test every item in the past when we use the litmus paper, the pH paper (used in this lab) is more expensive and therefore I prefer to limit the usage. follow procedures, and record their results. I rotated the room adding hot water from an electric water kettle that I had prepared earlier. The water didn't need to be hot- just warm. 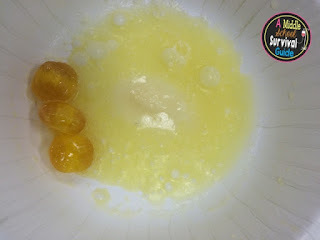 The students stirred the candy in the warm water to help it dissolve before testing. 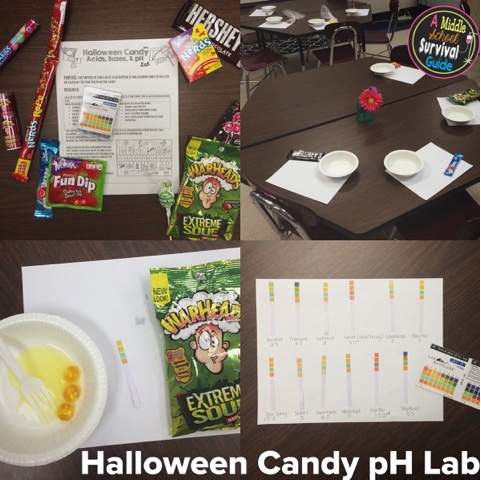 Above are pictures of a few of the candies being tested with the pH test strips. I purchased my pH strips here. These just happen to test the ones below. After completing the lab procedures, recording data, and answering analysis questions, we reviewed the properties of bases and acids. I posed the question that if an acid and base will react to neutralize, what will happen when a spoonful of baking soda (a base) is placed in the candy? As expected, the more acidic the candy, the bigger the bubbles/"fizz" when the baking soda was dumped in! and the results that were relevant to their world. They love being able to visualize acids and bases using indicators. insight they showed in analysis of the lab and class discussions. 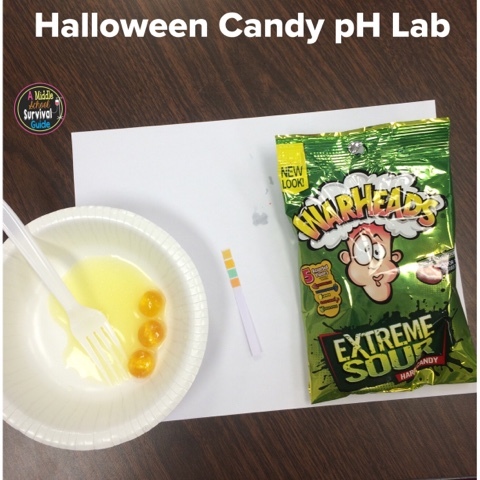 They realized there IS truth to "don't eat too much candy or you'll get a toothache"!